Canada Border Services Agency operates the Port of Pleasant Camp border crossing facility located along Highway 7 in northwestern BC. This site has a history of hydrocarbon contamination in subsurface soil and groundwater and is adjacent to a creek. Pleasant Camp was identified in the federal Contaminated Sites Inventory and flagged for further assessment to reduce environmental liabilities. 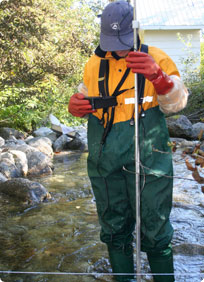 In September 2005, Morrow Environmental Consultants Inc., working on behalf of PW&GSC, retained Azimuth to conduct a field investigation and Problem Formulation for a Preliminary Quantitative Ecological Risk Assessment, within the Federal framework for ecological risk assessment. Then, as recommended after start-up of a soil vapour extraction and air sparge remediation system at the site, Azimuth conducted follow-up monitoring to confirm that risks to the aquatic receiving environment had been minimized.